So we are back this week with a mega post as we look at the end of The Six. I will do better at pacing The Oracle this month. So let's dive in and remember to enter the giveaway at the end. If you need to catch up on the discussion see the posts here. Darcy has passed through the grumps and seems to be spiraling into depression. I don't blame her totally. I mean she is underground and while it is suppose to be her summer vacation and she's stuck in lessons. The excitement of entering a magical world has totally worn off. To top it off, she is feeling a bit ignored by Rubidius. Almost four months had gone by an Rubidius had not asked to work with her individually since that day that he had passes her up for Amelia. Do you think it was just a convenient plot point or do you think there was a real reason for Rubidius no to work with Darcy? I also wondered if it because Rubidius didn't really know where to start with Darcy. The other kids all had "instruments" that gave him a starting point, but Darcy just has a ring that was already in existence before the prophecy. And maybe he is a little afraid of what her talent might be. The prophecy said it was something men have always sought. Maybe he thought he would be tempted to want it. But things are looking up. They are planning on being moved, somewhere above ground this time. And Rubidius has asked to see Darcy! Rubidius is in quite a state this morning. Did you ever wonder when reading it the first time why there was so much emphasis on his desire to turn lead into gold? Or did you think it was just a character point and a simplified way of reminding readers of alchemy? We find out Rubidius's reason why he hasn't been training Darcy. Do you think it is just a matter of perception? Is Darcy just "imagining" the whispered words and avoiding looks of the other kids? In this chapter, Sam's gift produces a mirror compact that belonged to Darcy's grandmother. Were you as confused about its appearance as the girls at this point? The princes are arriving. I wonder if people in Alitheia marry at a younger age than we do here. A hundred years ago it wasn't uncommon for a 14 - 16 year old girl to be married. Or maybe arranged marriages are common. That would explain why they think nothing of Darcy and Tellius getting married (though they know it isn't this year). So what do you think of Darcy's talent? And what about Lykos wanting to keep it a secret? Then we have the arrival of the princes. Do you think all of Darcy's nervousness can be attributed to her social anxiety and her knowing she is expected to marry Tellius or do you think even at this point there might be some fondness for him? A chapter about Tellius! We get to see him and Darcy interact a bit, though it does appear to be coerced interaction. I smile every time I read this. Darcy couldn't see Tellius's face because his back was to her, but Cadmus smirked and swept the pieces of their game to the side. "Not my guest," he said teasingly. Jumping up, he races to the door. "Come on, Tova, let's go see the lion!" I can just hear him in his little brother voice saying it. The only thing better would be if he had stuck out his tongue, but that wouldn't have been very princely though. Then there is their form of twenty questions. Could this meeting be more awkward? You would think they could have found a more natural way for them to interact. I get they are underground and in hiding. But get the group together to play a game or something. This chapter does provide some amusement and levity to the novel. Now see having Cadmus and Tellius have classes with the six is a much more natural way for Darcy and Tellius to get to know one another, except the sessions seem to be more like lectures than interactive. Maybe they should do a project together! More amusement thanks to Cadmus as he teases his brother and they get into a fight. What do you think about the fight between the brothers and the truncated conversation between the two brothers? Could Tellius already be smitten with Darcy? She is an older woman after all (lol). Then we get Lykos again. I kind of want to growl every tie he shows up. But a little tiny part of me feels badly for him. Speaking of feeling badly. My heart broke for Asa Rhea the first real meal they've had in months and it is interrupted. Who do you think betrayed them? Now we get an "edge of seat", nail biting chapter. Will they make it to Noineia? We get to see the narks in action and Tellius is anxious to prove himself. Was your heart beating fast in this chapter? Or was it completely wrenched out of your chest? Darcy and Sam are a bit traumatized and totally exhausted by the time they reach Noineia. What do think about this cloaked placed? When Yahto says that Darcy isn't the only one who's sick, do you think he just meant Eleanor or was someone else having nightmares? We don't know Tellius well, but he seems overly angry when Cadmus almost tells Darcy where they live. Is it just PTSD? I feel bad for Darcy, because I don't think she really meant anything by it. She just wasn't really thinking about what she was saying, you know just making small talk. Though with what is about to happen it is good Tellius cut Cadmus off. What did you think of Lykos and Darcy's first real conversation? All I could think of was that Lykos is a master manipulator. Amelia and Darcy have it out. I thought Amelia had a valid point, though. We find out who betrayed them. I still think Lykos had a role in it. Dean is getting really good at his talent. Now that we know a bit more about the talents of The Six, which one would you prefer to have? "Eleanor!" she exclaimed happily, somewhat begrudging the easy way that Sam and Amelia hugged the older woman in greeting. She'd never been able to hug people so easily; she always felt uncomfortable. Another characteristic I have in common with Darcy. I'm not a hugger either. I watched The Last Airbender shortly before reading this book and the talk of elemental magic reminded me of the movie. We get back to the mirror in this chapter. Sam is beautiful in the mirror and we know that Darcy is rather ugly and apparently Amelia is not as pretty on the inside as she is on the outside. I had forgotten that the others had looked in the mirror. And my dislike of Lykos grows stronger with this comment. Yes? He answered her. You called? He sounded amused, almost mocking. We meet Lupidor in this chapter, though we don't know his role in the deception of Darcy. Speaking of which, Darcy has doubts about everything that Lykos says but it isn't enough for her to pursue her doubts. Completely understandable, but still saddening. I hope young readers of the series learns from Darcy. Did you know what was really happening when Darcy imitated Dean's talent? Maybe Rubidius is right and it is just a matter of perception. Darcy was convinced that the others had forgotten about her birthday, but they had not. In the last chapter when she had that thought, I wondered how the others knew in the first place when her birthday was. I guess since Sam and Lewis already knew her before camp that perhaps they knew the date. So Dean is sick. Had you put two and two together? A second item came out of Sam's pocket. A key. How mysterious? I can't remember if anything came out of Sam's bag for anyone else. The group gets in a fight and we find out they have been distancing themselves from her. So maybe it isn't all in Darcy's head. Either way, it is the straw that breaks the camel's back so to speak. We have arrived at the part of the story that I have been dreading. The part where I'm yelling at Darcy to listen to her instincts. We learn the difference between tsellodrin and tsellochim. I have to keep reminding myself that Darcy is only 14, but I can't help but wonder how she can't see how Lykos is using her, particularly when he gives her what to say to the wolves. Unfortunately, when Darcy is seriously second guessing her actions it seems she unable to turn back. We get our first look at Tselloch. It is interesting that his minions are often described as oily for that is how I think of Tselloch. Did you think Darcy would be swayed by Tselloch? The first time I read The Six I thought that Darcy's time in the dungeon spanned more of the book, but this second reading her stay felt much shorter (and indeed is only a small piece in the book). Why do you think Tselloch chose to appear as a panther? Darcy seems to finally being see everything clearly now, but is it too late? How many of you tried to reason out a why for Darcy not to have really touched his nose? Would it have mattered if she had actually touched him since she had said she chose him? I had forgotten about the man who removed her from her cell. I couldn't remember if he was friend or foe. The melody rose in a gentle rhythm. Darcy had never heard music like it before, and she could not identify the instrument, but it was like an organic voice. Did you think Darcy was having auditory hallucinations or did you think it possibly could be Amelia? Darcy seems more confident in her swimming abilities this time. Looking up from under the surface of the water, Darcy saw a strange, reddish light arcing through the air toward her and her captor. As though in slow motion, it grew closer and closer to them, flickering slightly. It was a flaming dart! For a moment I thought it might be one of Dean's arrows, but then I remembered it was for messages. Yay! Darcy's been found! And it seems all has been forgiven among the six and everything is explained. Darcy almost choked at those words. "Tellius is coming here?" "Naturally! He was here almost every day when you were sleeping." Darcy's face registered her horror, but Sam grinned at her. "It's actually kind of cute, Darcy. He's been really concerned about." This passage reminds me of later in the serious where Darcy is being nursed back to health. However, then there is no Nurse Dembe. It also lends more credence to my thought that Tellius likes her more than he lets on. The Six has made up, now we see Rubidius's attempt to make amends. I felt we got to see a different side of Rubidius's personality. He has been gruff and at times seemed to be more impatient than he might should have been with them (he may have had some unrealistic expectations). But in this chapter, I think we see the real Rubidius. One who truly cares for the kids, I think even outside of their role to save Alitheia. And now it is time for them to go home. Though there is a party, it doesn't appear to be a farewell party. There are no real goodbyes. And they are back! Since they got all their belongings back without anyone giving them to the kids, I assume Darcy's shoes reappeared too. And of course, we can't end this without one more encounter with Colin Mackaby. Do you really think no one else knows about what happened to Darcy? Surely the nurse discovered her unusually cold hand during her recovery. And even if she didn't know what to make of it, wouldn't she have let Rubidius know and he would at least suspect? 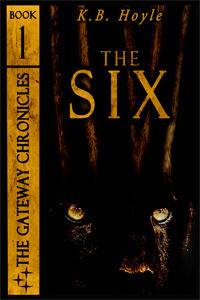 What were your favorite part of The Six? We will start The Oracle next week. We will discuss chapters 1 through 11. I hope you will join me. If you haven't read it yet, get your copy at Amazon. I have never seen the move 'The Last Airbender' (or read the books), but I have had many, many people tell me The Gateway Chronicles reminds me of it!